The City of Riverside is proud to present the Shop Riverside Community Card. The Community Card increases awareness and traffic for participating businesses and builds shopping loyalty in Riverside, as well as support city services and local education. The card is a remarkable marketing opportunity for local businesses, as well as a highly-effective fundraiser for the local schools and organizations in Riverside. What could be better than everyone profiting from this worthy cause! The card has more than 200 participating local businesses and provides a wide range of special offers for the cardholder. From dining to shopping to relaxing at a spa, you can find businesses all over Riverside that will be proud to honor your card. Organizations throughout Riverside will sell these cards to interested members of the community for only $15 each. All participating organizations will receive $10 for every card sold. 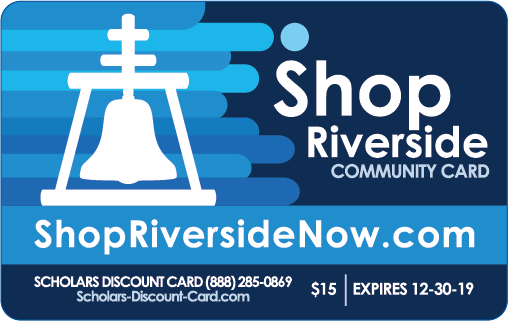 The new Shop Riverside Community Card will be good until December 30, 2019. Shop Riverside is a City of Riverside awareness campaign designed to educate residents on the benefits of shopping locally. 1% of all taxable sales within the City returns to the general fund to support city services, such as police, fire, museum exhibits, youth programs, libraries and much more! The City of Riverside and Scholars Discount Card are working together to bring you this valuable program. If you are a Merchant within the City of Riverside and would like to participate in the ShopRiversideNow Program please fill out the contact form and a representative will contact you shortly. February 08, 2014 Free E-Waste Drop Off -- We'll take anything with a plug!